powerful helper to its blind master. The perfect GSD Guide Dog will possess a quiet and calm demeanor, maintain a high level of initiative and possess a high level of concentration while it is working, and a strong will to continue to do the work for which it was trained as long as it can help it's owner. Often called Seeing Eye dogs or Guide Dogs for the Blind, these are working dogs that have been specifically trained to lead its blind owner safely to his or her intended destination. Qualities that make solid seeing eye / guide dogs are intelligence, good health, moderate size, sound hips and gentle temperament. and this breed has been used almost exclusively for many years as a service dog because of its incredible working abilities and intelligence. 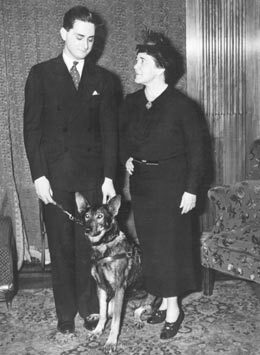 An American woman named Dorothy Eustis decided she might try to train guide dogs for the blind. In fact she was still considering the possibilities of this when she penned a story for The Saturday Evening Post about the potential for guide dogs for the blind. He was paired with Buddy, a German Shepherd Dog. Mr. Frank then spent the rest of his life campaigning for guide and service dogs rights along with his beloved GSD Guide Dogs. If you come upon a GSD Guide Dog team at work, or see a Seeing Eye dog in harness please resist the urge to talk to, feed or pet that working dog. Remember, the dog is at work and any distraction from its job with it's handler may be very dangerous no matter how well-intentioned you may be. If anyone were to take hold of a blind person's arm, the dog's harness, or otherwise distract the working dog or its owner from what they are concentrating on. That could easily be compared to any unexpected intrusion - such as suddenly grabbing the steering wheel of a moving car away from its driver. If you were ever to think that a dog guide team needed help or assistance of any kind then please ask the owner first if he or she would like help. That in turn would give the guide dog handler the option of accepting or turning down your offer. If you wanted to talk to or pet a Seeing Eye dog (Guide Dog), please ask the owner for permission first before following through. Please remember to respect the guide dog teams and their working ability, both dog and handler. Most Guide Dogs work until they are around 8 years old or so, but this varies among individual dogs depending upon many things, among them the guide dogs health and lifestyle. Today guide dogs are trained to assist people with many different disabilities. There are Hearing Ear dogs to assist the deaf and other dogs that assist the physically disabled. 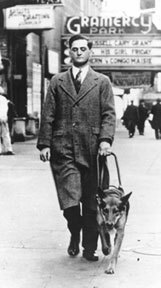 All of the people who have benefited from the use of a guide dog, however, owe their thanks to German Shepherd Buddy and Mr. Morris Frank. The Americans with Disabilities Act reinforces the right that dog guides are permitted in hotels, public transportation, restaurants, stores and other places to which the general public is invited on a federal level. All US states as well as Canadian provinces have laws that forbid discrimination against a blind person who seeks admission or service when accompanied with a dog guide.